One thing I love about the cooler weather is it’s time for soup! I can eat soup all year round but there’s something about about eating a bowl of hot soup on a cold day that makes life better. Minestrone soup is my favorite soup but there’s something about a creamy potato soup that has been slow cooking all day that can seriously move into that top spot with no problems. In a large skillet, heat olive oil over medium-high heat. Add onions and cook until the onions have softened, about 3 minutes. Add the garlic and thyme* and cook for one more minute. *When using dried herbs, get maximum flavor by rubbing or crushing the herbs between your fingers as you are adding them to your skillet. This releases more of the herb's flavors. To make the base of the soup's broth: Add the flour to the onions and garlic and stir to combine. Cook for about one minute and then slowly add 1 cup of chicken stock, stirting to combine. Transfer onion mixture into the slow cooker. Add cut the potatoes and the remaining 4 cups of the chicken stock into the slow cooker. Cover slow cooker with lid and set to cook for 6-8 hours on low or 4-5 hours on high, until the potatoes are "soft" and tender, but not too mushy. Once the potatoes are done, turn heat to low or warm setting. 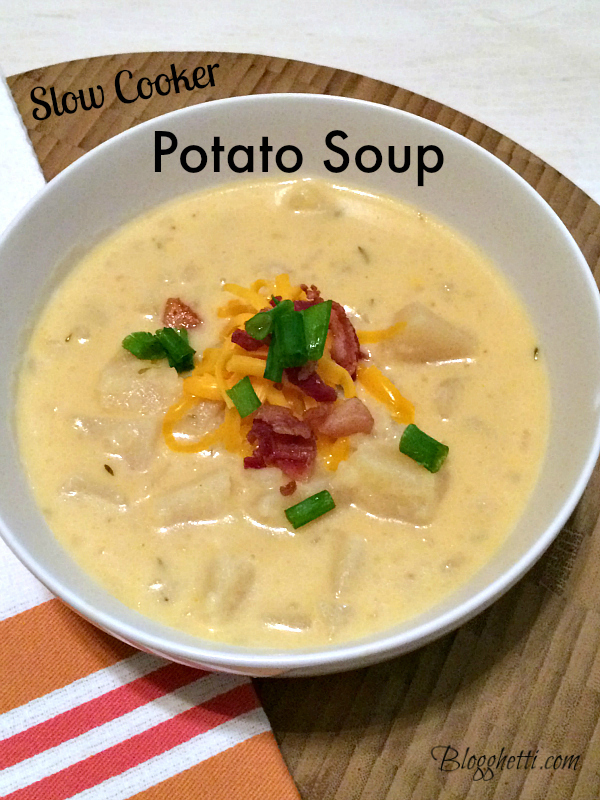 Ladle out 3 cups of potatoes from the slow cooker and place in a large bowl. Using a fork, mash the potatoes. Add milk and cream. Stir to combine. Return mixture to slow cooker. Add shredded cheese to slow cooker and stir to distribute. Cover slow cooker and let sit for 5 minutes until cheese has melted. Season with ½ tsp black pepper. If you feel you need to add more salt, do so, to taste. Serve with green onions, bacon pieces, additional cheese, and/or sour cream.